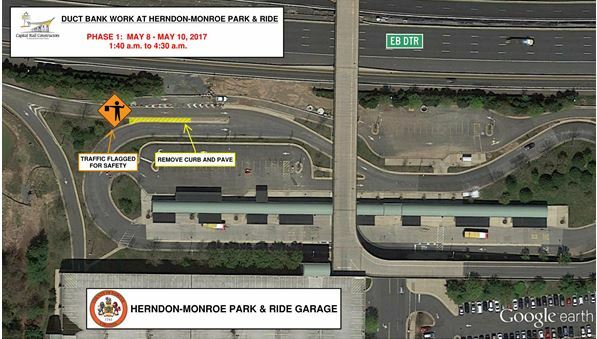 On or about the nights of Monday, May 8 through Wednesday, May 10, from 1:40 a.m. to 4:30 a.m., Dulles Corridor Metrorail Project crews will be removing curb and paving a median area near the intersection of the eastbound Dulles Toll Road entrance and commuter bus lane at the Herndon-Monroe Park & Ride (see drawing below). A flagger will be in position to guide drivers safely around the construction. Work in this area will continue in phases until mid-June to allow installation of duct bank for the Metrorail Silver Line Project. Additional notifications will be issued ahead of changes in traffic patterns as the work progresses. Drivers are asked to please slow down, exercise caution, pay attention to barriers and signage, and obey all flagger instructions. All work is weather dependent and subject to change.